Reward Gateway CEO Glenn Elliott is never one to do things by halves. 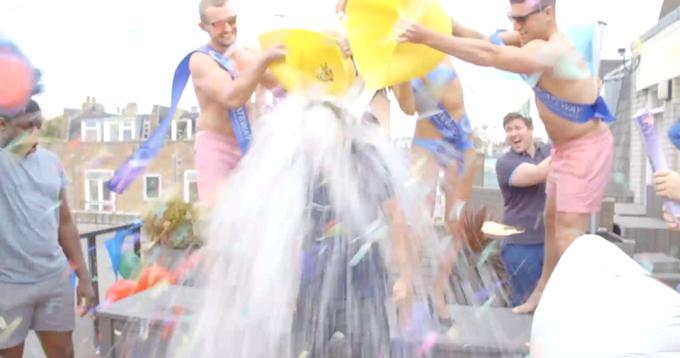 When he was nominated for the ALS Ice Bucket Challenge by Matt Waller of Benefex, Glenn decided to step up his game by hosting the first ever ice bucket carnival on the roof of the London office. Glenn is the first CEO ever to nominate his entire workforce to complete the ALS ice bucket challenge, and he’s given them seven days to do it. That’s all 181 employees across three continents. Each employee will donate one hour’s pay to the charity, and the company is matching every donation pound for pound. As the first company to nominate its entire workforce for the ALS Ice Bucket Challenge, Reward Gateway has supercharged its donation-giving powers, raising £5245 for MND/ALS. The question is, will is spark a trend for other companies to follow suit? You can only pull off things like this if you have an engaged workforce. But doing them is incredibly powerful because achieving the seemingly impossible binds everyone together. The entire extravaganza was pulled off in just 48 hours from idea to completion. And if you want to hear the story from Glenn's EA Charlie Lofthouse's perspective, you can read it here.